New York City likes to go big or go home—and that includes its stance on climate change. Mayor Bill de Blasio announced Wednesday a goal to divest the city’s $189 billion pension fund out of fossil fuel corporations within five years. Instead, New York City’s going to sue them. Currently, the city invests about $5 billion of its pension dollars—which go toward providing retirement money for local firefighters, police officers, elementary school teachers and other city workers—in nearly 200 fossil fuel companies. That’s a lot of money. 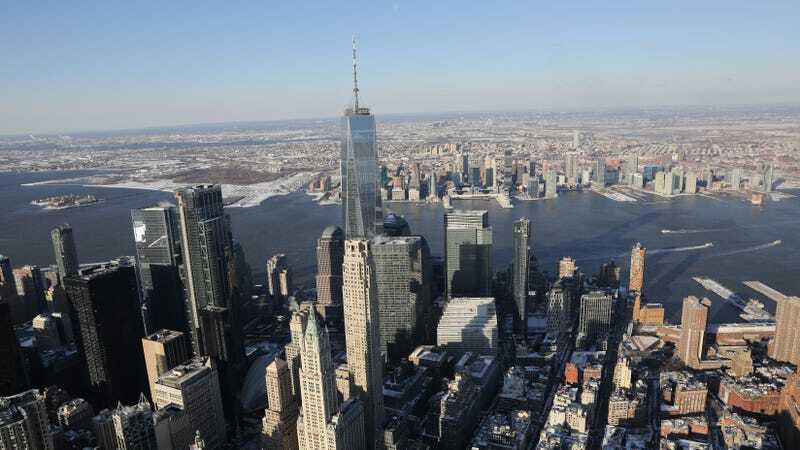 The divestment decision makes New York City the first major U.S. city to take its pension dollars out of the climate equation. It’s a big slap in the face to the fossil fuel companies most responsible for climate change, including major corporations like BP, Chevron, ExxonMobil, and Royal Dutch Shell. But New York City isn’t just ending its financial contributions to these companies—city leaders want these companies to give them some money, now. That’s right: New York is suing, man. It wants to recuperate some of the billions of dollars it’ll need to deal with the impacts of climate change, from sea level rise to extreme weather. De Blasio doesn’t want the entire bill to land on taxpayers’ laps, especially since some of our biggest fossil fuel companies knew climate change was happening way before the public did, and they tried to keep it hush-hush. Under President Donald Trump, the federal government isn’t taking many steps to address the worldwide disaster at hand. He barely seems to understand the science behind climate change, and his right-hand man Ryan Zinke, Interior Department secretary, is trying to drill any and all coastal waters. So, cities and local municipalities are stepping up to tackle the existential crisis. Across the country, mayors and local representatives have come together in the form of different coalitions, including We Are Still In and Climate Mayors. Now, New York City is trying to convert these statements of support for climate action into actual action. Beyond divesting and asking fossil fuel companies to pay their fair share, the city hasn’t clarified its next steps. We don’t know how it plans to re-invest this money, or how it’ll go about making that decision in the first place. That’s one concern that comes to mind for Elizabeth Yeampierre, executive director of UPROSE, a Brooklyn-based nonprofit focused urban sustainability for the city’s poor and people of color. Her organization supports this divestment decision, but she still has questions. For example, will the city create a commission to work closely with grassroots organizers? How will city leaders ensure a top-down approach doesn’t drown out the voices of local communities? Yeampierre does, however, recognize this is an important and necessary step in the face of an administration that refuses to acknowledge the urgency of climate change. She welcomes any effort from the state and local level to do what the president fails to. “We need to move away from an extractive economy,” Yeampierre said, “and that’s not just about fossil fuels. It’s about our labor, our communities, our displacement. We need reinvestment in a just transition in our communities across the city. Divestment starts that transition. But as Yeampierre emphasized, time is running out. Climate change is happening here and now for many, as evidenced by the flooding New York City saw during Hurricane Sandy and the torrential rains that swamped Houston during Hurricane Harvey.